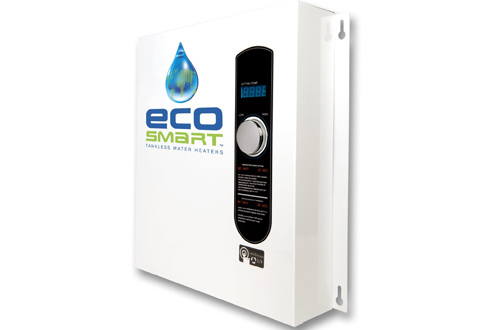 Did you know that you can heat your water without incurring high costs in energy and installation? 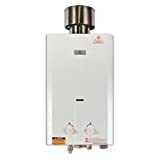 Well, this can be easily achieved by investing in the gas and electric tankless water heaters on the market. But considering the fact that the market is flooded with multiple heaters, it would be quite good in case you knew the ideal models to choose from. We have compiled a list of the best heaters based on energy efficiency, heating capacity, and affordability. So feel free to read through and select the model that will suit you best. 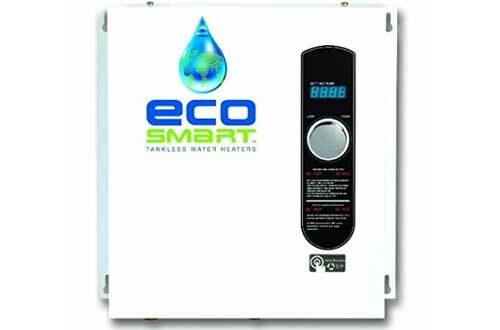 ECO 27 boasts as one of the largest among Ecosmart’s long line of tankless electric water heaters. 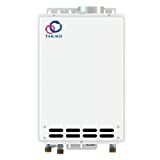 This unit has a heating capacity of 3 GPM, which makes it ideal for large families or residential use. Despite its size, it utilizes lesser energy compared to other conventional heaters. With its advanced self-modulating technology, it allows you to save a whopping 50-per cent in heating costs. Not only does it save on energy costs, but it also takes up minimal storage space. The heating temperature can easily be adjusted in 1-degree increments. Its design is for efficiency, durability and easy replacement. 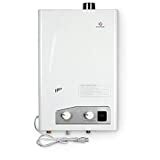 This is a compactly-sized water heater suited for domestic and commercial use. 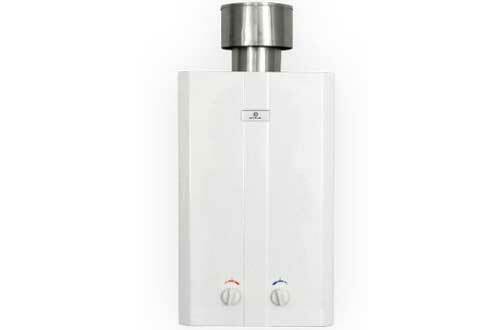 It features an advanced modulating mechanism that offers an ingenious way of saving on heating costs. Its large capacity heat exchange is made of brass and copper to guarantee maximum performance and durability. The heater has a built-in temperature control that gives you total control over the water temperature. It has the capacity to heat 4 gallons of water per minute. 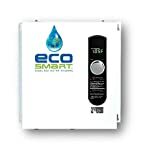 In case you desire a more portable option in water heaters, then Eccotemp L5 will certainly suffice. Unlike most water heaters, it is powered by liquid propane. It features an advanced battery ignition system that offers quick and easy start-up. This unit delivers a pressure of between 20 to 80 PSI. At maximum pressure, it delivers a flow rate of 1.4 gallons per minute. 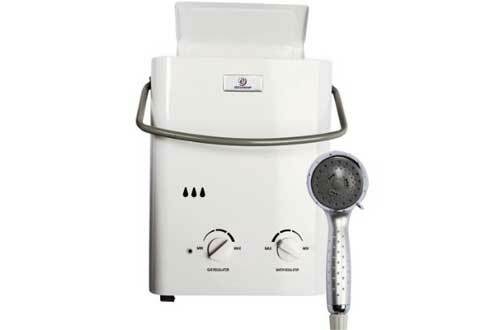 The water temperature can easily be adjusted from 80-150 degrees Fahrenheit using the incorporated temperature dial. Would you like to save an incredible 60-per cent in energy costs? Well, Ecosmart ECO 18 water heater offers you a chance to do so. The heating temperature is digitally controlled and allows you to customize it in 1-degree increments. 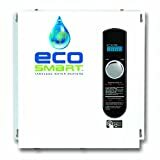 Its 2.5 GPM heating capacity means that it can comfortably feed two showers without experiencing any water shortages. The heater allows connection to a 3/4-inch plumbing system. 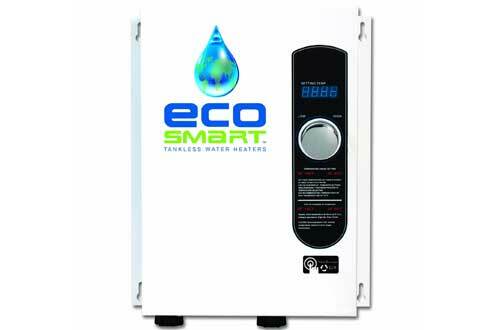 Save substantially on space and water heating costs with ECO 36 water heater. 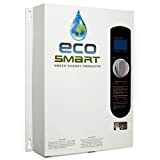 Compared to traditional water heating systems, it allows you to save 50-percent on energy costs and 90-per cent on storage space. 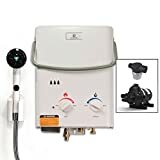 Its excellent heating capacity of 3.5 GPM makes it an ideal choice for those that desire a constant supply of hot water. And like most of Ecosmart’s water heaters, it offers you the luxury of adjusting the temperature in 1-degree increments. 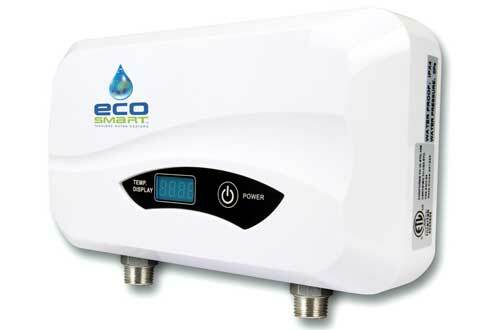 Heat your water in style with this portable outdoor water heater from Eccotemp. The heater is powered by propane gas and generates 74,500 BTU’s. It heats 2.65 GPM within the temperature range of 80 to 165 degrees Fahrenheit. 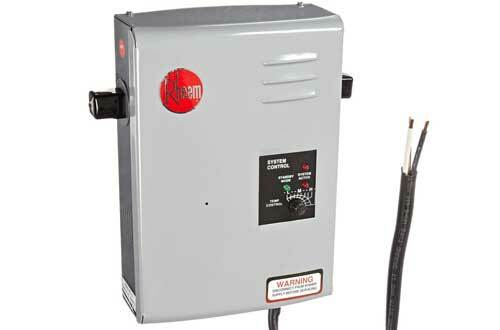 The heater works within a pressure range of 25 to 80 PSI. 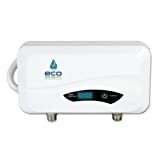 It features a 20-minute timer that automatically shuts off the unit whenever the water stops flowing. 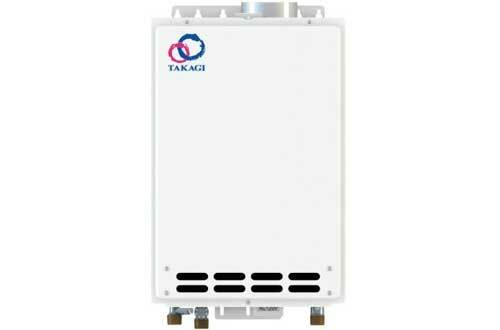 If you desire a large heating capacity, then look no further than this advanced heater from Takagi. Powered by natural gas, it delivers a whopping 140,000 BTU. Such an excellent heating capacity allows it to generate a maximum flow rate of 6.6 GPM. This makes it ideal for residential use. It incorporates automatic temperature regulators that maintain the water temperature at the correct level. Get a constant supply of hot water at reduced costs with POU 6 water heater. Like most of the company’s models, it allows you to save a maximum of 60-percent on heating costs. It also allows you to save considerably on storage space; up to 12 cubic feet. The heater has a maximum heating capacity of 1 GPM. It heats water to a maximum temperature of 150 degrees Fahrenheit. It features a 0.5-inch connection point to your plumbing system. This water heater comes in a sleek, contemporary design. Its gas-powered burner has a heating capacity of between 25,000 to 74,500 BTU. At maximum setting, the heater handles about 3.6 gallons per minute. It generates a maximum water pressure of 80 PSI. The heater features an advanced electronic ignition system for enhanced safety and easy start-up. It has a venting system that guarantees maximum safety and performance. This heater is ideal for household use. The innovative technology of Bosch is not only limited to its power tools but also extends to its water heaters. 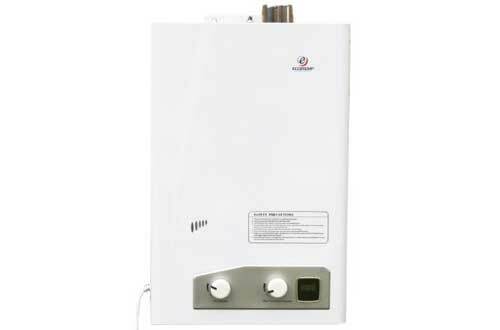 Therm 520 HN is one of its notable models that has greatly revolutionized the way we heat water today. 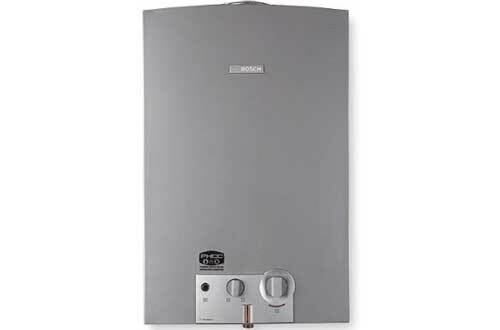 The burner runs on natural gas and features a maximum heating capacity of 117,000 BTU. It has a state-of-the-art ignition system that is powered by the force of flowing water. The heater is vented to ensure maximum performance.